The people of Jammu and Kashmir have rejected violence as heavy voter turnout in the first two phases of the assembly elections has shown, Prime Minister Narendra Modi said and lauded their "unflinching faith in democracy".Modi Monday sought a decisive mandate for the Bharatiya Janata Party (BJP) in the state assembly elections and launched a scathing attack on the Congress, National Conference (NC) and the Peoples Democratic Party (PDP).Addressing a BJP poll campaign rally at Raya Morh in the Vijaypur assembly constituency of Samba district, Modi said the people of the state have rejected violence as more people had pressed the EVM buttons during the first two phases of the state elections than have ever used their fingers to press the AK-47 triggers here. "I salute the people of J&K a thousand times for their unflinching faith in democracy," he said, a day ahead of the third round of the five-phase assembly polls.The elections began Nov 25 and end Dec 20. The vote count takes place Dec 23.Modi said the Congress, the NC and the PDP have ruled Jammu and Kashmir during different periods in the past and the problems of the state are due to the misgovernance and nepotism by these parties.Modi paid tributes to the brave soldiers who have been laying down their lives for the sovereignty and integrity of the country. "I am addressing you from the land where Brigadier Rajender Singh was born and who laid down his life fighting the enemies of the country in Uri in 1947. I offer tribute to that brave son of the soil. "I am wearing the turban today which was worn by Pandit Prem Nath Dogra (founder of Jana Sangh in the state) and I ask you to keep the honour of this turban," Modi said. "I promise you the love you have been giving me will be returned with interest to you through the development of this state, but you must give a decisive mandate to the BJP for fulfilling this promise," he said. More than 50,000 people attended the BJP rally here.The prime minister said in the past it has been the Congress, the father and son party (NC), and the father and daughter party (PDP) that ruled the state. "Did all of them do anything for you in the past? Would they do it in the future? You have tried them and they have failed you," he said.He attacked the Congress, saying the party aligned with the NC when it needed to share power with them and later stabbed the NC in the back. "Before that, they shared power with the PDP and when people asked them to give account of their misdoings, the Congress withdrew from that alliance too. Now the Congress is fighting elections against both these parties, saying all the misgovernance during the past was because of the NC and the PDP," Modi said. "We need to ask the Congress what had they been doing...," he said.The prime minister said there are 12 lakh refugees who were forced to come to Jammu and Kashmir at different periods of time in the past. "I promise that we will rehabilitate these refugees and rehabilitation is their right which they will get," he asserted. He said the parties who ruled the state in the past never treated the Jammu region as a part of the state. 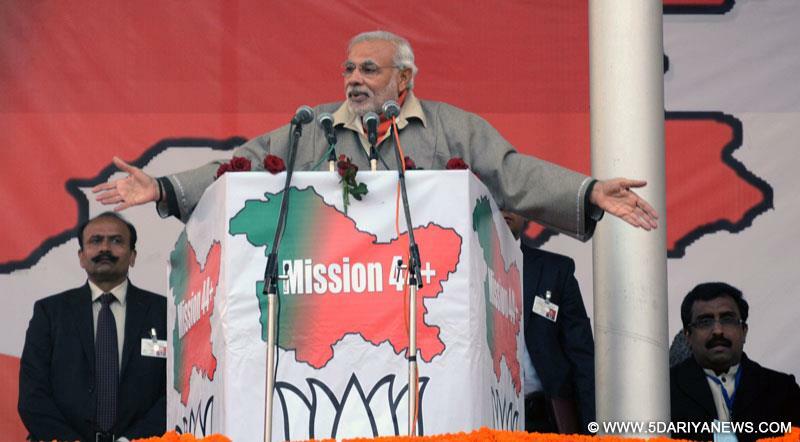 "The BJP believes in equal opportunity for everybody. We believe in inclusive growth and development. You give me your support, I will give you equal opportunities for development," he said.Modi said people need employment, irrigation for their agricultural fields and better healthcare facilities for the elderly.